The Tennessee Advanced Energy Business Council wrapped up another successful Annual Meeting in Nashville thanks to Bridgestone Americas. Bridgestone Americas recently moved into a brand new building in downtown Nashville deemed the Bridgestone Tower. The 30-story high-rise building provided a remarkable venue and demonstrated Tennessee’s surge in its advanced energy economy. Attendees heard from featured guest Scott Becker, Senior Vice President of Administration and Finance for Nissan North America. 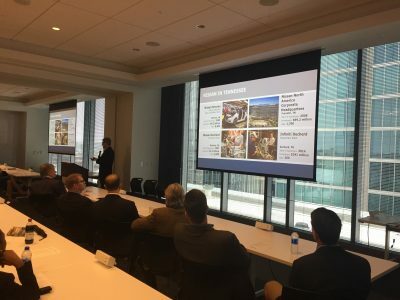 His presentation focused on Nissan’s contribution to Tennessee’s advanced energy economy providing good-paying jobs for Tennesseans and the growth the company has experienced since its original decision to locate to Tennessee. He also discussed Nissan’s corporate vision striving for Zero Emissions through its electric vehicles and Zero Fatalities through its autonomous drive technologies, all leading back to the Nissan LEAF. Scott Becker presenting during TAEBC Annual Meeting. Members also had the opportunity to hear from TAEBC’s newest board members in a panel moderated by Vice President Cortney Piper. Trish Starkey with Schneider Electric, Marc Gibson with UT, and Chris Bowles with Bradley were all formally appointed to serve on TAEBC’s board. The newest board members were asked a variety of questions including what their thoughts were on Tennessee’s current advanced energy economy, outlooks for the future, and what areas within the state’s advanced energy ecosystem they felt could use improvement.